The Teignmouth relief lifeboat Mary Lewis was launched immediately with three volunteer crew on board. The five fisherman on board the trawler had taken refuge on the dry side of the wheelhouse; the lifeboat crew managed to take all five fisherman onto the lifeboat, with the lifeboat suffering some damage from the edge of the stricken trawler. The lifeboat returned quickly to the lifeboat station where paramedics were waiting. All of the casualties were a bit shaken and cold; paramedics examined them and pronounced all OK.The lifeboat station shore crew provided hot drinks and blankets, and the casulaties were allowed to go when they felt ready. 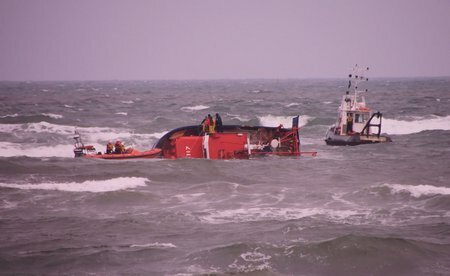 The lifeboat is currently (Tuesday 31 January) standing by while efforts are made to attach a tow to the trawler.